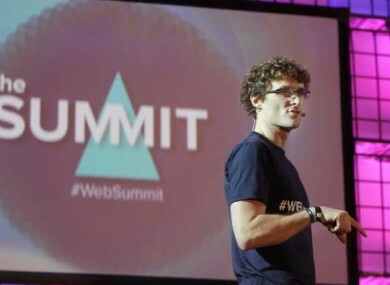 The summit’s founder Paddy Cosgrave said it was the company’s “absolute preference” to stay in Ireland. THE WEB SUMMIT has published the e-mail correspondence between Government officials and itself, in the weeks before Web Summit organisers announced the summit would move to Lisbon next year. The mails show how the relationship deteriorated as the summit’s founder Paddy Cosgrave repeatedly requested assistance for the event. The letters show that Cosgrave didn’t ask for funding but was concerned with four main issues - traffic management, public transport, hotel costs and WiFi at the RDS. Cosgrave repeatedly asked for the State’s involvement in organising these issues in the e-mails. Arriving at the European Council in Brussels, Taoiseach Enda Kenny said it was his belief that the Web Summit’s decision to relocate to Portugal was a “commercial decision”. “They’re quite entitled to that decision, and I wish them every success in Lisbon,” the Taoiseach added, and noted that he has supported the event since he was in opposition. The government, for its part, have always been very encouraging of the Web Summit since its fledgling state. The agencies of the government, like the IDA and Enterprise Ireland, have contributed financially, and other elements of government, Fáilte Ireland, Bord Bia, the Science Foundation, would have contributed to the Web Sumitt in various other forms. The Toaiseach said that he was in contact with Cosgrave personally recently, and offered every assistance the government could. It wasn’t the government writing a cheque for this, but being very supportive, very encouraging all along the line. In an e-mail dated August 21 2015, Cosgrave outlined to the Taoiseach’s Private Secretary Nick Reddy exactly what was being offered from other cities outside of Ireland. However, Cosgrave added that it was the company’s “absolute preference” was to stay in Ireland. However, eight days later Cosgrave wrote again to say he had still not received a response. Cosgrave emphasised that the summit was ‘not looking for a penny’ but added that if the four issues of concern were not dealt with then the Web Summit would be “too big, too unmanageable, too risky for Dublin”, adding “we need your engagement”. Reddy responded two days later, saying he was on a trade mission in France and would get back to him. The Web Summit founder also pointed out that they had never managed to get a single meeting with Dublin’s City Manager, but were constantly invited to meetings with prime ministers of other countries, including Number 10 Downing Street. Moreover, no Minister has ever attended a meeting yet they all show up for photos at Web Summit. Clearly, I’m despondent that we are literally being forced out of Ireland just for the lack of some very basic things like a plan for traffic management and public transport similar to sporting events. Seven days later, on September 17, Cosgrave replied by reiterating the need for a plan. We are not looking for a penny, just a plan. Without a plan for Dublin city, even an indicative one page plan for 2016, we cannot remain in Dublin. On September 21, Cosgrave then wrote to the Assistant General Secretary at the Department of the Taoiseach John Callinan explaining his concerns. Callinan replied on the same day with a draft framework for engagement. The next day Cosgrave described Callinan’s response as “misleading”. We are looking for four specific issues to be specifically addressed in some “small way”. What you have sent is not a plan, but a plan for a plan. There are no specifics. “What we were looking for in Ireland was just four simple issues, we stressed again and again that we were not looking for money. We just hoped that something could be put in place similar to a football or rugby match where there are traffic calming measures, because there would be 30,000 people this year in Dublin and that was possible everywhere else in Europe. He explained that last year about 10,000 attendees had to walk back from the Web Summit because there wasn’t adequate public transport. The reason that we left Ireland is that, it wasn’t until the day before we made the announcement that we received anything and what we received was a three page plan for a plan. Cosgrave ended by saying he “would love to come back to Ireland in the future”. We’re Irish, we’re an Irish company staffed with mostly young Irish people and we’d love to do something in Dublin. The Web Summit has a three year commitment with Lisbon. Email “Revealed: The emails that show why the Web Summit left Dublin”. Feedback on “Revealed: The emails that show why the Web Summit left Dublin”.